Install cycling shelters and secure storage for cycles to be stored during the working day. Consider changing rooms and showers so employees can freshen up when they come into work. Offer lockers and storage facilities for personal belongings or workwear. Investigate the possibilities of local cycle maintenance and road safety training for those cyclists who require them. 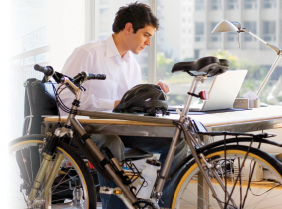 Encourage take up of the Cycle To Work Scheme, as it can benefit both the employer and employee. Promote the benefits of cycling amongst staff, particularly emphasising the savings to be made in petrol and possibly commuting time. 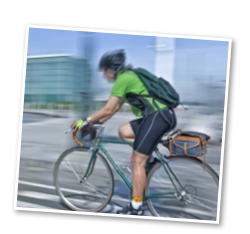 Consider flexible working hours so cyclists can avoid the rush hour periods. The 2014 Tour de France will start in the UK on the 5th July 2014. The two opening stages travel through the stunning yet challenging routes of the Yorkshire Dales and Pennines and the final stage will visit the London 2012 Olympic Park, ending on the Mall. Government experts have said the financial benefits of the Grand Départ are expected to exceed the £88 million generated the last time the Tour de France came to the UK in 2007 when London hosted the prologue and opening stage. With a worldwide audience of over 3 billion, millions are expected to line the route, and Yorkshire in particular is gearing itself up for an influx of visitors, with both businesses and individuals being encouraged to get involved and support the event. Cycling is booming following the success of British teams in both the Olympics and the Tour de France and according to consumer research company Mintel, over 40% of UK residents now ride bikes. Anyone who underestimates cycling only has to stand by the side of a major road leading into a city centre at rush hour and watch the endless stream of bikes passing by as commuters beat congestion and rising fuel prices. Thousands more bikes have appeared on our roads in the last couple of years and for many people they have become the main mode of transport to commute to and from work. Plus, improved cycle networks and the nation’s desire to stay healthy all make cycling even more appealing. The popularity of the sport is supported by figures from the Government’s ‘Cycle to Work’ scheme which has seen increases year on year since the scheme started. As part of the initiative employees can savemoney on bikes and related safety accessories by making them completely tax-deductible. Employees effectively ‘hire’ a bike from their employer by paying monthly instalments that are taken from their salary before tax. The hire agreement usually lasts for between 12 to 18 months, depending on the cost of the bike. After this period, the employee then owns the bike. Typical savings for employees are between 32% for basic rate taxpayers and 42% for high rate taxpayers, but the actual amount depends on the employee’s personal tax band and the way the employer runs their scheme. Employers can typically save 13.8% of the total value of salary sacrifice, due to reductions in Employers’ National Insurance Contributions (NICs) due. If the employer uses external finance (i.e. borrows the money to buy the bikes from an outside agent) then savings will be approximately 5% lower. A Cycle To Work Scheme? Save money - Typically, organisations can save money through reduced National Insurance contributions. Fitter, healthier staff and improved productivity - One study found that people who cycle to work experienced a 39% lower rate of all-cause mortality compared to those who did not – even after adjustment for other risk factors, including leisure-time physical activity. Improved attendance and staff retention - As well as improving physical health, cycling has a positive effect on emotional health, improving levels of wellbeing, self-confidence and tolerance to stress. Environmental benefits - The average person making a typical daily car commute of four miles each way would save 0.5 tonnes of CO2, or 6% of their annual carbon footprint, by switching to cycling. Good news for your corporate social responsibility. Reduced parking and congestion - Nottingham City Council is leading the way on this, but the workplace parking levy will affect many in the coming years. A levy of £253 per year per workplace parking space in Nottingham has been made in 2012, rising to around £350 per annum by 2015. By reducing cars in the car park, perhaps you could repurpose or even sell some land?